It’s been a year of truly unpredictable weather here in the UK. First we were battered by the Beast from the East back in February and March, then temperatures soared into a scorching heatwave which took us through most of September. Now, the weather is set to become unpredictable again in the upcoming winter, with stormy weather followed by the first proper snowfall. Obviously, it’s important to make sure your business is prepared! As a plastics manufacturing company, here at Excelsior, our plastic grit bins are one great way to ensure your business is protected, but there are a couple of other things you can do, too. Why would weather affect your business? The Met Office’s latest warnings cover a couple of major weather events, both of which you’ll want to keep yourself posted on, as a business owner. The first of these is Storm Aileen, which is set to hit the UK early next week. Those of us up here in the North are going to be especially affected, with fierce rain and winds that are expected to reach gale force. Straight after Storm Aileen, chillier temperatures are then going to set in almost immediately, with the later half of October forecasted to bring us heavy snowfall in what’s predicted to be the coldest winter in a whole decade. From your experiences earlier this year, you’ll likely already know from experience how much hassle and danger heavy snowfall can bring. 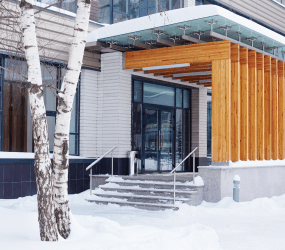 Snow and ice has especially serious safety implications for your business, and it has the potential to damage your profit margins, too. So then, how can you avoid this? What can you do to prepare for heavy weather? Drafts, leaks and cracks should be the first things to look for when you check over your building, especially in the piping. Before the freeze starts to set in, it’s also a good idea to clear out and shut off any outdoor plumbing that’s not absolutely vital, so that the remaining liquid doesn’t freeze and break your pipes. Fallen branches are a very real and very common hazard in stormy conditions, and they’ve even been known to kill people. For that reason, it’s a good plan to look out for any heavy branches that you think look especially flimsy, and have a think about removing them before the storm hits. If these branches aren’t technically on your property, it might be worth having a chat with the people who do own them. Above all, stay safe, and stay informed. Plastic grit bins are just one example of the huge range of plastic products we offer here at Excelsior, not to mention our ability to rotomould bespoke plastic products for our clients. You can take a look through our plastic manufacturing case studies to find out what we’ve achieved for previous clients, or alternatively give us a call on 0161 765 2010, and we’ll be happy to answer any questions or queries you might have.